The original concept: designed as emergency belts to be used in place of V-belts in case of unexpected failure. Today ACCULINK belts find application in many other fields as original equipment, thanks to their performance. 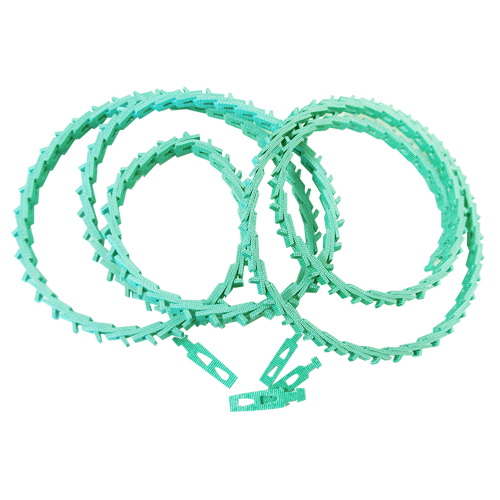 The ideal temporary replacement or permanent substitute for conventional rubber V-Belts, ACCULINK belts combine superior strength, durability and quick easy assembly to keep equipment up and running at the same running horse power ratings as rubber belts. Furthermore, ACCULINK belts can have wide length variability simply by modifying the number of links. ACCULINK belts are manufactured with a revolutionary new process which creates smooth, precise side profiles on each link. Links are made with a polyurethane polymer reinforced by a multilayer woven polyester fabric. ACCU-LINK belts are manufactured with a revolutionary new process which creates smooth, precise side profiles on each link. Link are made with a polyurethane polymer reinforced by a multilayer woven polyester fabric. Are you interested in ACCULINK?